Rafe’s appearance on May 29, 2017, as a guest on The Goddard Report. The topics include, can the new Canadian Tory leader beat Trudeau? Click here to listen. 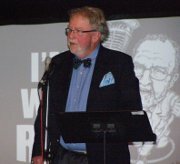 The Goddard Report: BC Election – Where’s the Policy and the Money? Rafe’s appearance on May 3, 2017, as a guest on The Goddard Report. The topics are the BC provincial election, education, and health care. Click here to listen.